"I'm good-looking, don't you think?" Wearing a mawashi band, Tsaguria Levan looks at himself in the mirror and flashes a hearty smile. He is 22, competing in the world of sumo wrestling. It took him only two years to get to one of the two top divisions, juryo. He is now gaining lots of attention under the name Kokkai (Black Sea). Levan was born in the Republic of Georgia, in the city of Sukhumi. His father was a Soviet Union wrestling champion, and this may explain the son's powerful physique. A civil war broke out in Georgia soon after it became independent. The conflict and destruction dragged on, forcing the family to escape to the capital, Tbilisi, when he was 12. There he entered the Georgia Sports Academy and began studying wrestling, hoping to compete one day in the Olympics. When he was 18, he did very well in free-style wrestling at a European tournament, placing first in the 130 kg division. Later, a crisis: "I was told, 'You're too heavy.' You see, they changed the wrestling categories. I weighed 135 kg, and they told me I couldn't compete again unless I dropped down to 120." Just when his future was looking dark, he learned about sumo wrestling on TV. Sumo wrestlers can be as heavy as they want. Another thing tempting him was that sumo is a professional sport, unlike anything in his country. A scout from Japan happened to come to Georgia looking for new sumo wrestlers, and suggested he sign up. And that is how he decided to go to Japan. Sumo is well known for its strict hierarchical system. Wrestlers belong to a "stable" (heya) run by an oyakata, who is both the boss and the teacher. Junior wrestlers have to cook and look after the daily needs of the older wrestlers. All of this was new for Levan. "I had a hard time at first. The food was so different, and I didn't understand the language. But the okami-san (the boss's wife) kindly taught me some Japanese. And I couldn't give up, because I had decided before I came to really make a go of it." Up on the hard clay platform, the sumo wrestlers grapple and collide, and they have no time to think at the critical moment. A win happens in a split second, unlike ordinary wrestling. In sumo, the aim is to toss the opponent or get him out of the ring. The tough traditional training concentrates on preparing wrestlers for that moment. "Japan is a land of ancient tradition. Sumo is one such tradition, and it, too, has a Japanese ideal — to try just as hard as you can. Georgia, where I was born, is still young, so it has a lot to learn from other parts of the world." Levan gets up at 6:30 every day, and trains in the morning. Then he eats a lunch called chanko-nabe, a stew with lots of vegetables and meat to give him more strength and weight. In addition to his traditional training regime, he works out at the local gym in the evening, to build up his muscles. All this training has made him faster on his feet. He lives with other wrestlers at a "stable" called Oitekaze-beya, in Soka, Saitama Prefecture. When he has time to relax, he likes to listen to Japanese music and watch TV in his room. "What I like best is to practice hard, work up a sweat and see my muscles grow. I know I can do well, so I just have to do it." His ambition now? To become a yokozuna (grand champion sumo wrestler). Then his parents, who are rooting for him back home, will be able to see him on TV. He has another dream too — to repay them somehow for looking after him over the years. 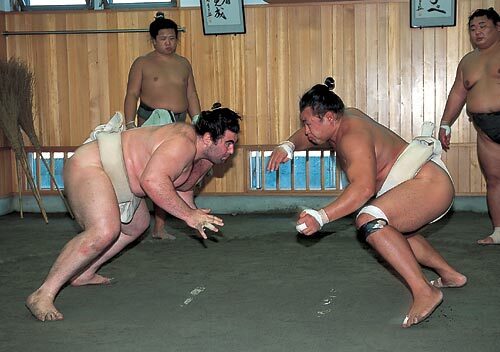 Tsaguria Levan was the first ever European sumo wrestler to enter the topmost division in sumo: the makuuchi. Known by the shikona, or ring name, Kokkai, which is Japanese for "Black Sea" he has made his presence felt in the upper layers of sumo rankings. Standing 188 cm tall and weighing around 160 kg the former Free-style wrestler is easy to spot on the platform, wearing a baby-blue mawashi and a slight five o'clock shadow. Tsaguria was born in the Republic of Georgia on March 10, 1981. He inherited his interest in wrestling from his father, who was a well-known wrestling champion in the then Soviet Union. The Civil War in the Republic of Georgia, following the collapse of the USSR, forced the Levan-family to leave their hometown of Sukhumi and move to Tiblisi in 1993. Tsaguria Levan was 12 years old when he came to Tiblisi, and here he joined the Georgia Sports Academy: he wanted to be a wrestler and he wanted to be in the Olympics. He did very well, and by the time he was 18 he competed in free-style wrestling in the 130 kg division - until the rules changed! Suddenly, he was too heavy to wrestle. Weighing 135 kg he would have to lose at least 15 kg to be allowed to wrestle, and he knew that would be a problem. Kokkai states that it was watching sumo on TV that gave him the idea: sumo does not have upper weight limits. That suited him just fine. Sumo had another thing going for it too: it was a professional sport unlike the wrestling he previously had been competing in. So, when spotted by a sumo-scout from Japan, he left home to become a sumo wrestler. Once in Japan he joined Oitekaze beya. He took the shikona Kokkai, and began learning Japanese from the okami-san - the wife of the trainer (the oyakata). He trained and did his chores, and in 2003 he was promoted to the juryo division, the second highest division in sumo. Kokkai performed well in juryo, and within a year (in January 2004) he entered the makuuchi division after getting a 14-1 result in the November basho (tournament) 2003. Though he was soon joined by Bulgarian Kotooshu and Russian Roho, he was the first European in makuuchi. Kokkai moved steadily up through the ranks, reaching maegashira 1 in September 2004. Since then he has endured make-koshi (fewer wins than losses) 4 times, and this has moved him back a little, landing him as maegashira 6 in the July 2005 Banzuke (Official Ranking List). Kokkai can sometimes look unstable and somewhat flailing, but he usually comes around to some quite neat sumo. He has learned to watch his legs, a detail that caused him trouble for a while. One of the "Behemoths of sumo"1 Kokkai will most likely always be in the upper half of makuuchi, but I find it unlikely that he will rise above the rank of komusubi2. I wouldn't mind if he proved me wrong, though.